Owner: Veronique Gagnon, St-Louis-du-Haha, QC. WOW on July 8th and 9th 2007: Nisky gains his Rally-O title with scores as high as 199 and a 1st place in competitive obedience!!! Way to go Veronique & Nisky! Please visit Nisky's page to learn more about him http://www.ombrenoir.com/pages/nisky.htm. And on June 23rd 2007, Nisky gain is CD title! 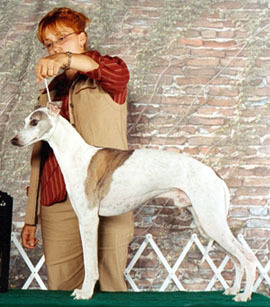 Thank you so much Veronique for believing in Nisky and proving that whippets can be as good as a golden retriever in obedience ;-) !!! PCD, October 22 2006, MCQ, QC. 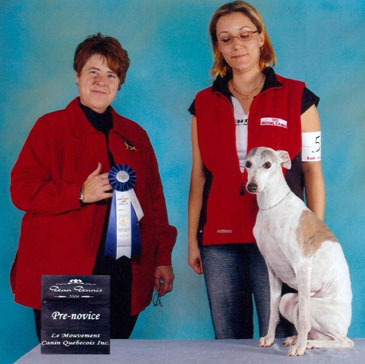 Nisky is proudly ForgetMeNot's first champion from its first litter. (Photo above) Nisky as a young puppy.